I was looking at some photos of our most recent road trip to Northern California last night. It was a perfect trip. Just the right amount of everything--adventure, day trips, visiting, rest and relaxation. Okay, possibly way too many goodies, but it was vacation, right? Rule number 3. You will not cry...or whine...or laugh...or giggle...or sneeze or barf or fart! Because we heard over and over and over. Name the movie. Getting to the destination is always the most difficult part of any road trip--after preparing and packing, of course--yuck. Ella is a great little traveler, thank goodness. But I still have to do my part to keep things that way. Here are a few tips that help us. In the past, the biggest reason I haven't loved road trips, is because I feel like I'm crammed inside the car and there's stuff everywhere! Drives me nuts (no pun intended--really). I wanted some breathing space this trip. 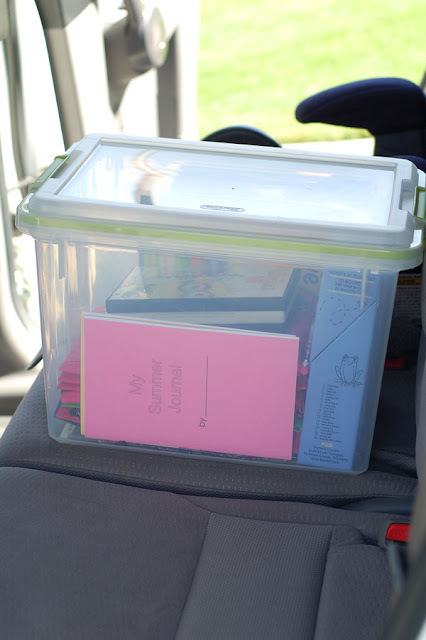 I've used Rubbermaid containers to pack for road trips in the past and love them. They stack nicely and I can see what's in each one. Each of us packed all our clothing in one container. If it didn't fit, it didn't go. (It's amazing what you can fit in one of those, especially if you roll everything up.) And yes, each of Ella's outfits were packed together in a plastic ziploc bag. I had another container we used for all our toiletries. The plan worked like a charm. 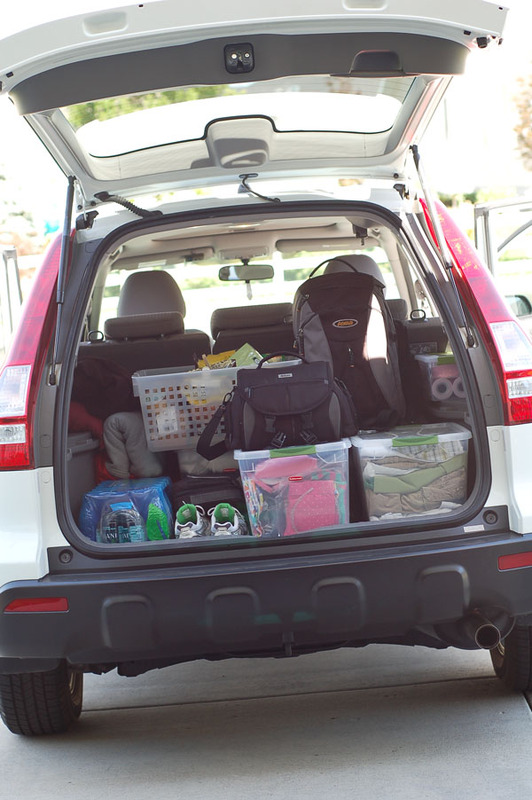 This is everything we took for an eleven day road trip. 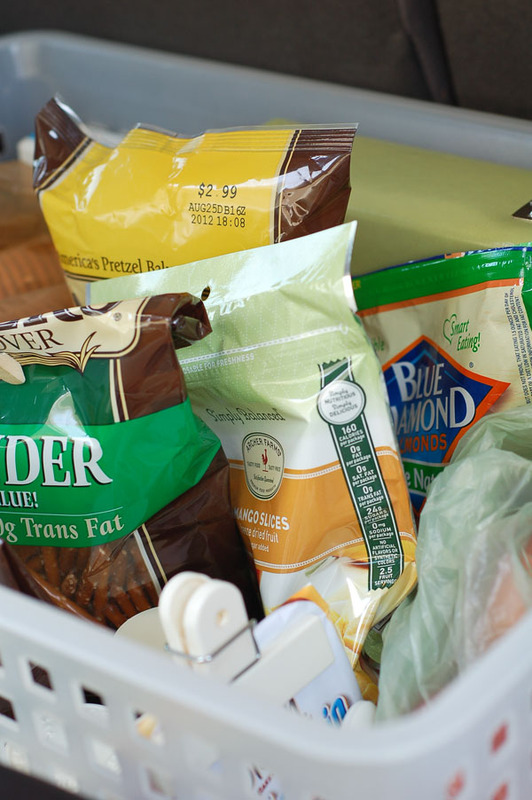 I packed our snacks and some food we needed in another plastic bin and put it in the back, but still within reach. (Ella will only eat Aspen Mills Honey WW bread and it's only in Utah. It's my favorite too.) I also tucked in my Family Favorites cookbook in case I needed/wanted to cook something. 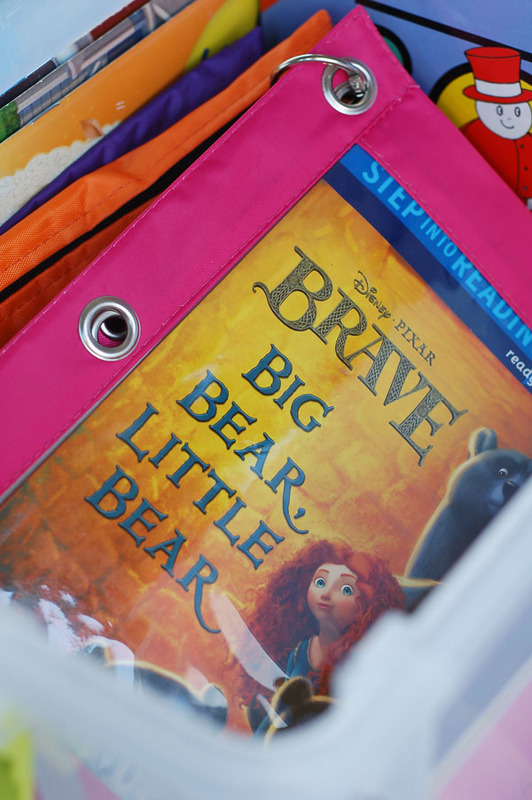 Besides the DVD player for Ella, I also always pack a "travel tote" to keep her busy. I include some new things I've collected along with some of her favorite toys, books and movies. This year I was inspired by the "busy bags" all over Pinterest and put together some very simple ones for Ella's tote. 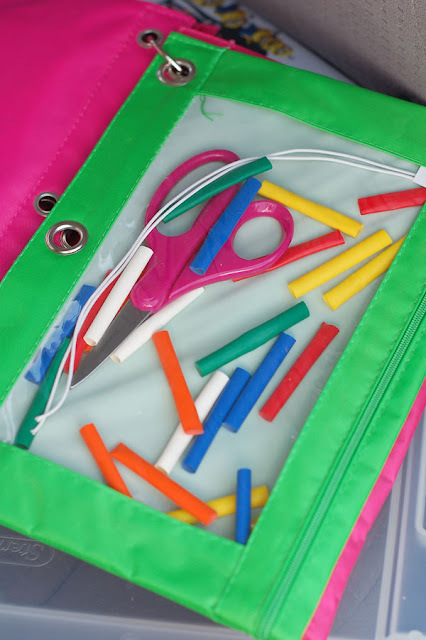 I mostly found items in the Target Dollar Spot and at Dollar tree, and packed them in zipper pouches I purchased at Walmart in the art section. A couple of the bags had a treat included. They were a huge hit! My intention was to give Ella one every couple of hours, but she was way too excited. :) She did a great job of gauging when to open a new bag to make them last. She even played with them in the hotel room. Okay, so I may have given away the name of the movie in one of the photos. 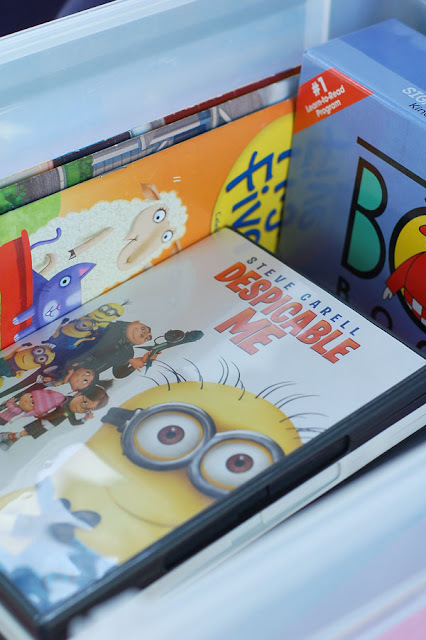 Yep, it's Despicable Me. We LOVE it and think it's hilarious! And it's a great movie for a road trip. You've got some great tips on road trips. 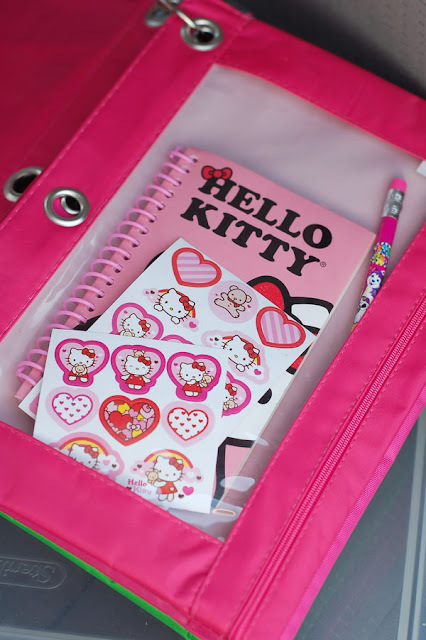 I especially like the zipped pouches with stuff in. Do you have any tips please on how to make these? 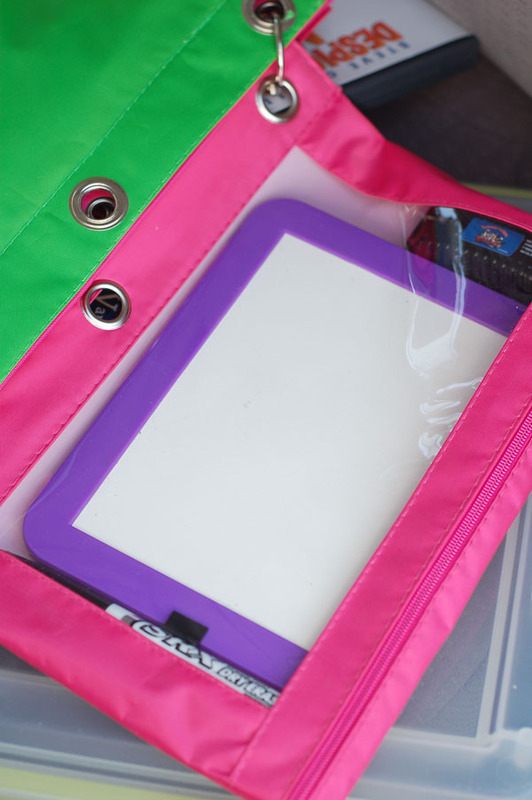 I was especially like some tips on how you made the holes to fit in the ring binder. Did you use a crop-a-dile? Fantastic! I am going to do this for our next road trip. Love your simple and powerful tips. I love bins and baskets.